David Zinn is a self-taught artist living in Ann Arbor, Michigan. 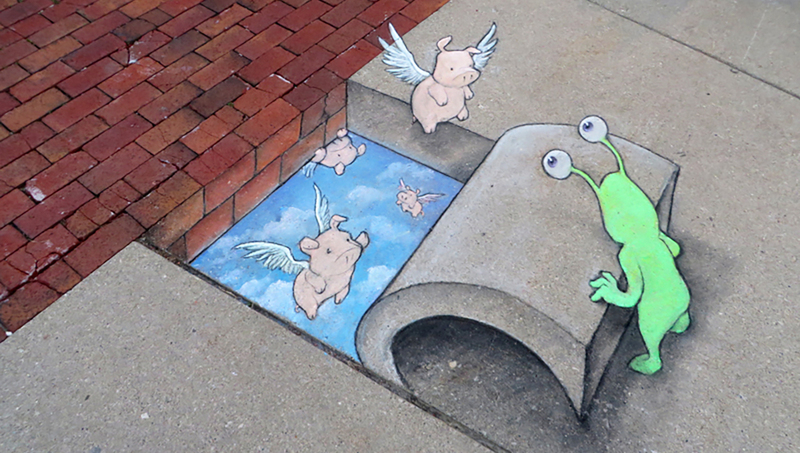 His small-scale fanciful creatures, often including a stalk-eyed green monster and a flying pig, are generally improvised on the street using chalk, charcoal and found objects. Davids etherial drawings generally wash away in the rain, but photographs of them have endured on Street Art Utopia, The Guardian, Central China TV, the Instagram Blog, Colossal, La Republica, Upworthy and many other places. – David is one of the most appreciated artists in the world in this genre of street art. His beautiful charcoal creatures usually pops up at the most unexpected spots, giving joy to the spectators, old and young. Sometimes David paints more permanent pieces to enlighten the city for a longer period. Personally I really love Davids work and the creative pieces always gives me a broad smile, says curator Shai Dahan. – No Limit 2015 got more of alternative street art. We do hope to see a lot of Davids pieces around town during the festival. Like Isaac Cordal last year David will find suitable spots for his peculiar charcoal drawings. We really got a good mix of styles this year and I guess that David will be a personal favorite to many visitors of No Limit, says project manager Stina Hallhagen.